Home > Chili > The Glow of Snow! It’s snowing, it’s snowing. Hey, this is very exciting for New Jersey these days. I can remember as a kid having tons of snow. 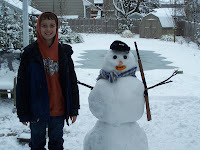 Actually, I took snowman building very seriously. 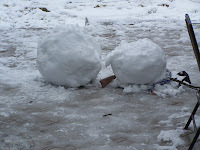 I used to create snow sculptures, not your everyday, 3 balls stacked on top of each other. Anybody could do that. Jeez. 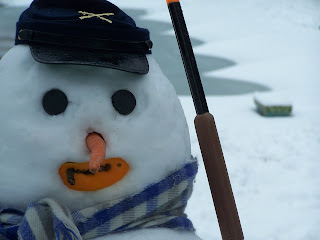 So, out we trudged and I proceeded to teach them how to make a respectable snowman. Actually, snow soldier as you can see. He is now keeping a watchful eye on us through our kitchen window. I have to say, I think what I love most about a snowy day, aside from the sheer glee in my boys, is the way it makes the whole house take on this peaceful light. My kitchen has windows on three sides and the whole room just glows. So, consequently, on the rare occasion that we get a day like this, after my chilly visit to the outside world, I enjoy hanging in the kitchen, putting something in the crock-pot or on the stove, and maybe even baking something. I know I am not alone with this either. A good cook loves a snowy day. On today’s menu is the Turkey, Butternut Squash Crockpot Chili I posted a while ago. Yum. And, very healthy. Give it a try. And thank you for indulging me with your attention to this post. Now, get out there and build a snowman. Here’s one last picture to get you motivated. Hey, and if you dare, send me a picture and we’ll just see who builds the best snowman. Bring it on! Oh, I mean it. See, I get a very competitive when it comes to snowmen, and Christmas trees. Especially, one with a drinking problem. This is my friend Jenny’s (6′ tall) snowman. She had to make sure I knew he was 6′ tall. She’s a bit on the competitive side too, you see. 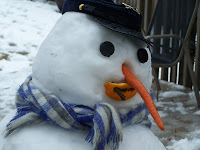 It looks like drinking is a definite problem in the snowman culture but at least he’s a happy drunk.